After a long year of school and stress, my body (& health in general) has definitely seen better days. That’s why I am SO excited that both Kate and I are doing the 5 Day Summer Reset Challenge hosted by (our fav) Registered Dietician, Heather Pavlik and her gal pal/STOTT trained pilates instructor, Stephanie Benton. Starting August 17th, this food & fitness duo will be sending out a grocery list, meal & workout plans along with daily fitness and nutrition challenges to everyone who signs up! Plus, IT’S FREE! That’s right, they are sharing all of this for free! I think one of the toughest parts of starting a healthy lifestyle is the temptation! Temptation to eat a piece of cake at 10pm or to skip a workout because you’re too tired. What’s great about this challenge is that Heather and Stephanie will have a secret facebook group that you will be added to. Through the facebook group, you will have access to talk to either of them personally and ask any questions you may have FOR FREE. Did I mention it’s free? Plus, through the group, you can get support from others taking the challenge! This is seriously so cool and I can’t wait to get started! For more information and to sign up, check out Heather’s post HERE or Stephanie’s post HERE. There will also be a few winners (because who doesn’t love free stuff?) in the challenge who will win things like KIND bars, fitness headbands, and jewelry! Whether you’re starting a new job (like me) or getting ready to head back to school, this is the perfect way to get yourself feeling ready and confident for all that is heading your way. So GO! GO! GO! Seriously, what do you have to lose?! 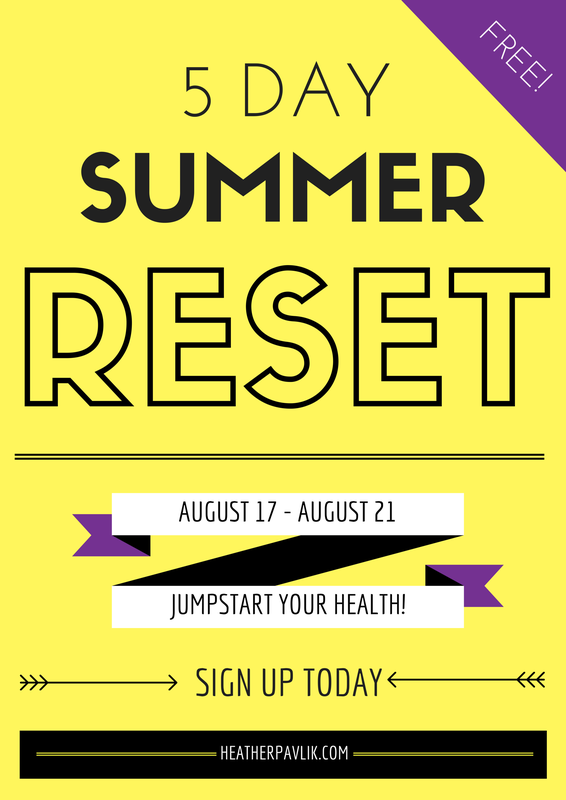 Follow us on during the challenge on twitter and instagram at #SoireeSummerReset and follow the challenge all together at #5DayReset2015! We will give you a recap post once we finish but who needs a recap when you do it along with us? !